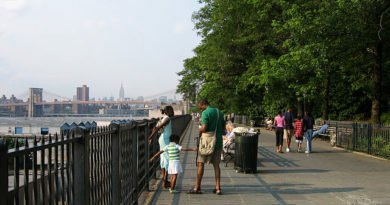 : Looking south at en:Red Hook Container Terminal on the waterfront of southwestern Brooklyn, towards Sacred Hearts & St Stephens Church (left), away from lower Manhattan, New York City. Courtesy of Bjoertvedt. 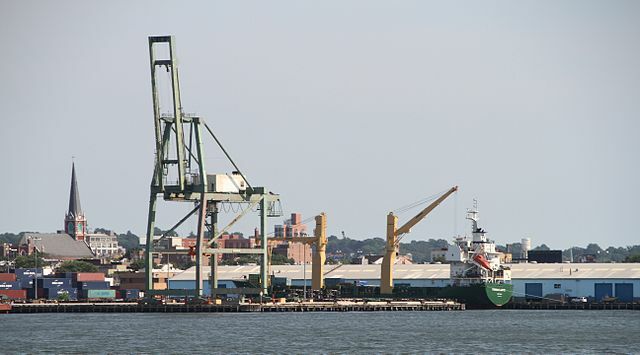 A new shipping hub to be called the Sustainable South Brooklyn Marine Terminal will create more than 250 quality jobs soon, as well as bringing commerce into the area, says the New York City Economic Development Corporation. SSBMT will receive a long-term lease until 2054 with the mandate to reactivate 64.5 acres of the terminal. NYCEDC envision the terminal handling 900,000 metric tons of goods yearly through the port, saving 11,000 truck deliveries each year. The facility will house new industries such as paper recycling and export, lumber imports, salt, project cargo, and much more. The terminal will stimulate growth of local businesses, the New York Harbor and the entire waterfront. Red Hook Container Terminal will not only operate the facility, but it will be a stevedore for SSBMT. “Today’s announcement of the selection of Red Hook Container Terminal group to operate the South Brooklyn Marine Terminal is a momentous step in the revitalization of the Brooklyn waterfront and the first step in the phased development of constructing a major deep-water container port centered at SBMT,” said U.S. Representative Jerrold Nadler.